With very little coaxing paperwhite bulbs will reward you with clusters of fragrant blooms in as little as four weeks. All you need is a container, a holding medium and water. Soil is not necessary; paperwhites will happily grow anchored in either decorative stone, glass, pebbles or gravel. I started my paperwhite bulbs in mid December, too late for Christmas blooms but perfect timing for flowers in mid to late January. I chose white pots that belonged to my mother and small river stones for anchoring the bulbs. I decorated the top with moss. The grande finale is obviously when delicate little white trumpets appear and release their characteristic heady scent. But I get great pleasure out of tracking the paperwhites' growth until they flower. This poem sums it up perfectly. Next year I'll try something suggested by researchers at Cornell University: to keep paperwhites from growing too tall and spindly, and to prevent droop I'll add a splash of gin (almost any hard liquor will do) to the water. It supposedly shortens the stems, lowers the center of gravity and prevents paperwhites from getting top heavy. Here are guidelines on how to coax paperwhite bulbs. Best growing time is between October and January. Place a layer of stones or glass to a depth of about 2 inches in a small vase or about 4 inches in a larger vase. 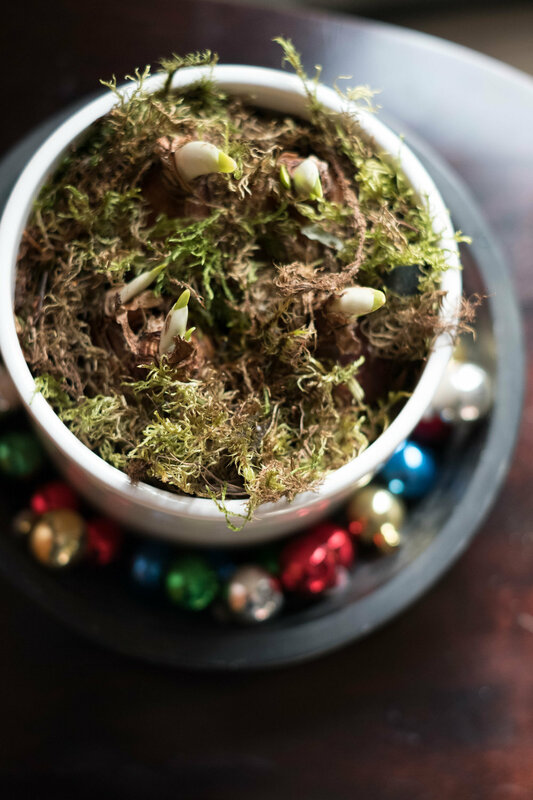 Place a layer of paperwhite bulbs close to each other, roots facing down. Put a few stones or pebbles around and between the bulbs to anchor them. Leave the tops of the bulbs exposed. Add water to just below the base of the bulbs. If the base sits in water, it will rot. If you are using a pottery vase, use your finger to measure the water level. Replenish when water level falls. Put in a cool and dimly lit or dark place for one to two weeks or until roots have begun to take hold and green shoots emerge. Then move the pot to a bright spot. 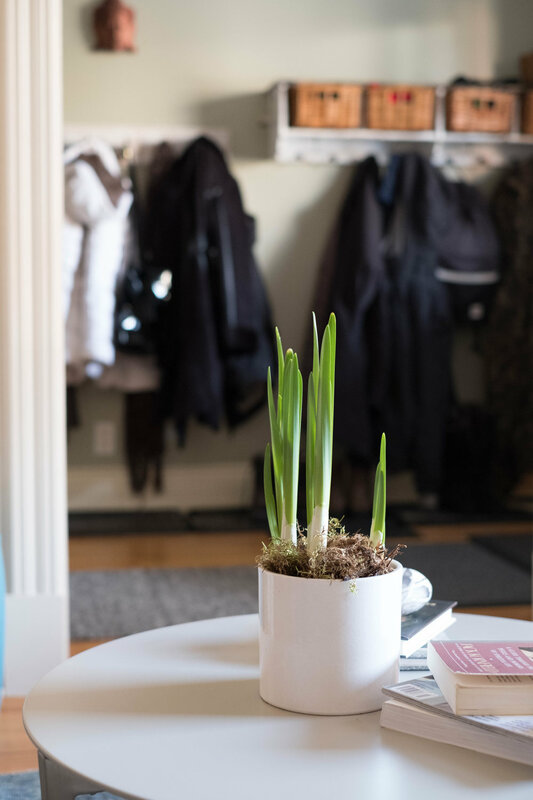 Four to six weeks later paperwhites should bloom, longer if in a room with less light. After your paperwhites have finished blooming, gently pull the plants from the holding medium and toss them in the compost as they won't flower again. Wash and dry the stones and the container for future use.